Let’s be honest. Sometimes life is really hard. We feel broken, lonely, shamed, hopeless. It’s hard to find the positive in anything. And why should we even bother to try? Everything is just messed up. But what if we made a point to find SOMETHING to be happy for. What would happen to us? Trust me, I’ve had my share of trials. Did you know I have a son who was in a car accident in his early twenties and now lives in a nursing home because he had a traumatic brain injury? It’s sometimes hard to “look on the bright side.” I get it. But here’s something to consider, research has proven that intentionally giving thanks for things in your life, even in the tough times, increases your happiness by twenty-five percent! Now tell me, who doesn’t want to be twenty-five percent happier? In a study done by Emmons and McCullough, they asked some of the participants to maintain a journal recording things for which they were grateful and a separate group of participants to record things they found annoying. 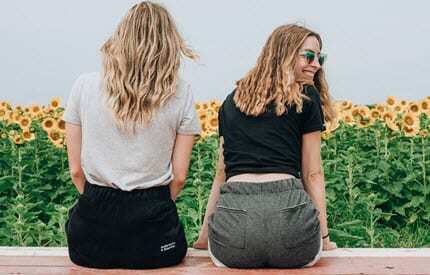 When the results came back they found that participants in the group monitoring things for which they were grateful had significantly higher levels of well-being than the others. It turns out that practicing gratitude increases happiness, optimism, and satisfaction with your life by approximately 25%. So how do you go about “practicing gratitude”? It could be as simple as making a point every day to stop and find at least one thing to be thankful for. And don’t convince yourself there isn’t even one thing to be thankful for because there always is. If you are choosing to not find even one thing, then you are essentially choosing unhappiness. That is your choice. But if you want to try to find happiness look around you. Here were some things I found to be thankful for in the midst of my heart ache for my son. These are a start. A start to training your brain to look for something good. I know it doesn’t make the bad go away, but your attitude will start to shift. You can also practice gratitude by keeping a journal and documenting things to be thankful for. This is a great tool to go back and read when you are feeling down. 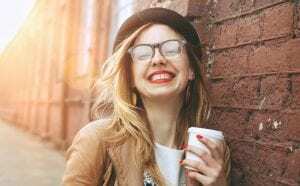 The study also found that grateful people stop focusing so much on their pain and problems, and rather start to see how they can help others in distress. It is a great morale booster to take your eyes off your own problems and focus on helping others. If you need some help to get started with how to give back, we’ve come up with a list of our Top 10 Ways to give back. Click here to view the list. There is a verse in the Bible that says, “Rejoice always, pray continually, give thanks in all circumstances; for this is God’s will for you in Christ Jesus.” (1 Thessalonians 5:16-18). God knew that life on earth wasn’t going to always be easy once sin came into the world, but he also knew long ago, what researchers have just recently proven…that if we continually give thanks through it all, we will make it through the tough times and find happiness. What can it hurt? Give it a try. Give thanks! Have you noticed there are many people who struggle with deep emotional issues? They are often sad and miserable and can stay that way for months, even years. These people are depressed. Depression is described as a prolonged unexplained sadness which affects everyday life. If you are depressed, you may feel trapped beneath emotions of overwhelming sadness and hopelessness. Maybe you lack the motivation, energy, and strength to face life’s many challenges. The good news is there are many people who have won this debilitating emotional battle. Join me as I talk with Samantha, Melissa, and Cody each who are in some way seeking to cope with their depression. I’ll also speak with Dustin who is creatively reaching out to people he knows are depressed. Samantha is 17 and just transferred to a new school. She knows a few people but can’t play sports and feels she can’t be herself. She just reunited with her real dad and her step-father doesn’t know. Most who are depressed are carrying too heavy of a load and over time become increasingly drained and weary. Because they are downhearted, it is difficult for them to identify what’s depleting their emotions. It’s like their emotional batteries are slowly but surely being drained. She transferred to a new high school. That would be a big adjustment for anyone, let alone someone at 17 and in their senior year. She loves sports but can’t play them this year because she changed schools. Changing schools would be more than enough but there’s more going on in her life. She just reunited with her birth dad and her step-father doesn’t know a thing about it. To make matters more complicated, she doesn’t get along with her step-father. In fact, they hardly ever speak. She feels it’s her against the whole family. Melissa’s been dealing with depression for about 7 to 8 years now. She was getting better but now is going downhill, since her therapist was murdered. It’s God, who can reach down in Melissa’s life and give her the strength to seek help once again. The Bible says, “Weeping may endure for a night, but joy comes in the morning.” Psalm 30:5b My prayer for Melissa is although there have been tears, even weeping, joy will come into her life, the kind of joy only God can give. Cody says he does alright fighting the depression back for a little while, but it always comes back. He’s felt a lot of rejection in his life. He first was rejected when he was 8 and his mom left him with his aunt. He doesn’t want to keep fighting and keep trying to prove he’s worth something to somebody. He’s tried to kill himself before, but his sister kept him from it 2 or 3 times. As in Cody’s case, sometimes you get to the point, where you just have to hang on. You tell yourself, I’m not going to quit, no matter how hard it is. Cody needs to give himself a break. He has a core belief that he’s worthless. He’s been blaming himself for this depression since he was a child. His mother, in her own dysfunction, helped drive that lies deeper into Cody’s heart by abandoning him when he was but 8 years old. Now, after all this time, Cody feels like he doesn’t belong anywhere. Add to that heartbreaking issue, Cody also has financial problems which seem more than he can bear. He feels like a broken man and will need every bit of courage to overcome what has been pounded into him. He already tried to kill himself and has thought about it a lot. Suicide is not the answer. Instead, may he find the victory over the dark clouds and may God touch his life and heal him. There is hope! If you are depressed, there are people God has put around you who will help you! I got the chance to talk to an amazing, inspirational guy, Dustin. Dustin’s friend lost her brother in a car accident, so Dustin wrote her what he calls, “feel better” letters. When she got depressed, she could read one of the letters and feel better. Dustin has now written over 100 encouragement letters for others dealing with depression. Dustin has his own struggles. He’s been homebound for 6 years because he has Ehlers–Danlos Syndrome where the collagen breaks down in the body and the joints won’t hold together anymore. Instead of being bitter towards God about his own struggles, he’s reaching out to others. What a powerful example he is. People who are depressed and reach out to help others find a whole new energy. 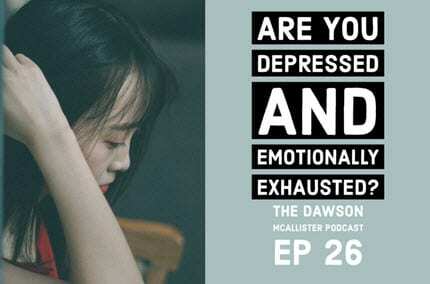 Did Today’s Episode on Depression Get You Thinking? I have to say it again. If you are depressed, there is hope!!! God is near to those who are crushed in spirit. He wants to heal your emotions. God wants to help you and He has put people around you to help you. Ask the Lord for help and strength and then look around and see who God has put in your life to help you. Also, check out our many resources for help with depression. Check out my eBook: Understanding Depression. Check out: Verses of Hope When Struggling with Depression. Check out my blogs: Feelings of Depression, To Those Who Feel Worthless, and How Can I Find Hope?. If anyone would have told me that you were going to come and leave so quickly from my life, I would have smacked them and called them a fool. We made it to 6 months. In those 6 months, you became my life. April, I have never met a more beautiful, bright, amazing and loving girl. You made me feel so far from alone. You made me feel like I mattered. You showed me the true definition of a best friend. But you were always so sad. I tried to do anything I could to help you forget your troubles. We went out on dates, hung out everyday, went and spent nights at the barn with your horses. April, we did everything we thought best friends were supposed to do, but just when I thought you were the thing that saved me from me, I got the worst news…that you took your own life. My best friend’s suicide shook me to the core. April, I’m sorry I couldn’t save you. You made me feel so much life where I thought I never would feel it again, you truly brought out the real me. I wasn’t afraid around you and you never judged me. I will not ever forget the last night I saw you. You called me and asked if I had a cigarette, and I saved my last one for us to share. When you came through my gate, your eyes were covered in tears. We sat and I hugged you and I told you we would get through this. That it was just another bump. You cried and told me that you couldn’t take it anymore, that you hurt too much. We talked for about an hour, I cleaned up your tears, and we said we loved each other. You told me you would call me in the morning. I never got that call, but you did that a lot so I didn’t think much of it. Two days later I found out you overdosed. All I could think about was that I really wish I could have saved you. I wish I could have said something to change your mind. April, everyone says it was an accident, but I know the truth. You were so full of life, yet so broken inside. I wish you could have seen how loved you truly were. Losing someone you love to suicide is a whole other type of hurt. I lost my first friend when I was 19, to a murder. That hurt me in ways I thought were impossible. But losing you, April, knowing you were in my arms hours before you decided to depart the earth, makes my heart feel in ways I never knew I could feel. We may have been friends for less than a year, but you were one of the most amazing friends I have ever had. April, you showed me what a real friend was and you showed me a true friend. April, losing you made me realize that I may be sad and I may want to die sometime, but I now fully understand the meaning of, “suicide doesn’t end your pain, it only passes the pain on to the ones who love you”. My message to anyone reading this and thinking about killing yourself….never be afraid to reach out and talk to someone! People love you! You are more beautiful and amazing than you think and you do have a purpose!